One of the latest symptoms of my "condition" is CRACKED OUT dreams. I live a quiet, peaceful existence during the day, but when my eyes are closed, boy howdy it's a wild ride. Last night via REM cycle, I was somehow kidnapped and forced to work as an intern for the Sarah Palin/Michelle Bachman campaign (My dreamself thinks they're running together). As their indentured servant, my duty was to buy their cigarettes. 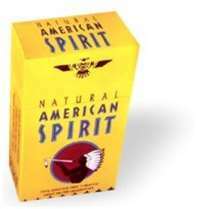 American Spirit cigarettes. Because we all know Palin's a total hipster. I would hand them cigarettes under the table. Then they would kick me. About three seconds later I was in a seamstress' living room. She was making me a prom dress, and while cutting the fabric said over and over "Since you're so fat, I'll have to cut it extra wide." What did you eat before you went to bed? Ha! I remember having crazy dreams too. It was always a fun morning, telling andrew about them. Dad, I think I ate oatmeal. Ellie, I'm glad I'm not the only one.